Experts are working to protect Lake Winnipeg with an innovative research project that removes pollution from wetlands while creating profitable bio-products at the same time. The secret is in harvesting cattails. The tall plants, topped with brown seed heads that look like hot dogs, have thickly invaded the lake's surrounding marshes in recent years. "If you harvest the cattail," says researcher Richard Grosshans with the International Institute for Sustainable Development (IISD), "you are actually permanently removing the stored elements and the phosphorous that's in those plants, and you're removing it from your aquatic system." 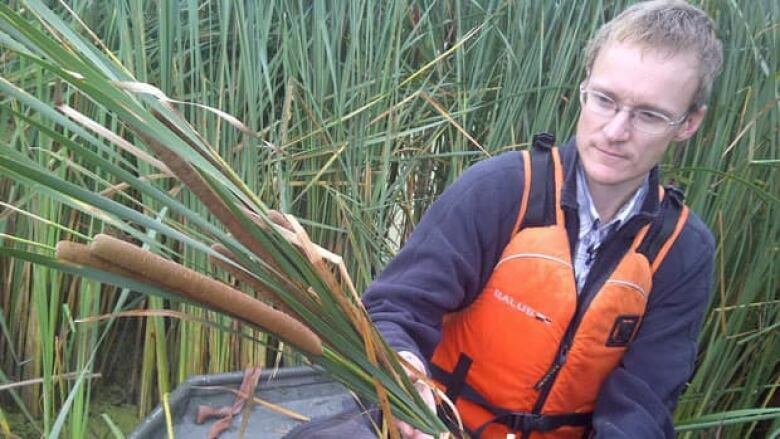 He says the fast-growing cattails, which can reach heights of 12 feet or 3.5 metres, are amazingly effective at absorbing nutrients such as phosphorous and nitrogen that enter the lake from farm run-off and sewage releases from across the continent. Grosshans and his collaborators at Ducks Unlimited and the University of Manitoba have been waist-deep in the wetlands project for five years, centered at the Netley-Libau Marsh at the south end of Lake Winnipeg. It is one of the largest freshwater wetlands in North America. IISD researchers believe cattails can be converted to commercially viable biomass stove pellets. (CBC)Now, the Netley-Libau Nutrient-Bioenergy Project is out to prove the plants can also be profitable. They are developing an industrial-scale harvester to collect the cattails and turn them into products such as fuel pellets that can be burned in industrial furnaces. 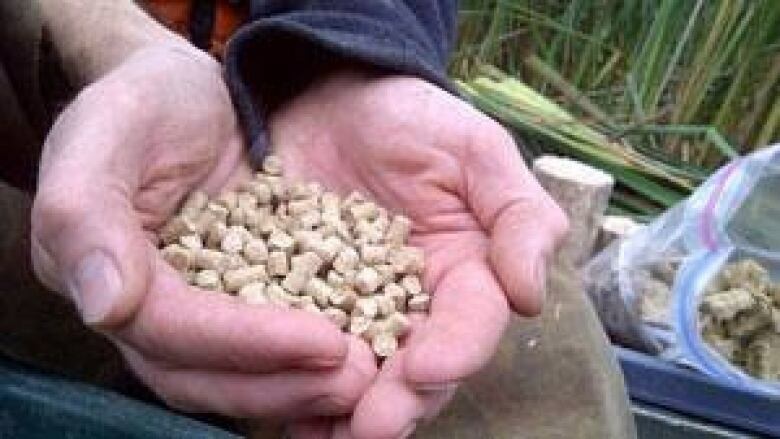 Bio-mass pellets produce less greenhouse gases than coal, and emission reductions can be monetized into carbon credits, further reducing the pellets' cost. Hutterite colonies and farmers would be likely customers. "They want to switch away from carbon," Grosshans said. "Especially with the [provincial] coal tax coming, it's going to be much more expensive." The ash from burnt cattails can also be used to create fertilizer, because it's still rich in phosphorus. Some see other bio-industry spin-offs from cattails too, such as ethanol and bio-plastics. "From the perspective of industry," says John Fjeldsted, director of the Manitoba Environmental Industries Association, "commercial success of a project like this could well spur the development of a strong clean tech sector." IISD's Director of Natural and Social Capital Program, Hank Venema, spear-headed the nutrient-removal project. He says it was an effort to make the taxpayer-supported think tank, headquartered in Winnipeg, more relevant to Manitoba. "It was important to bring our international knowledge base to solve problems in our backyard, " says Venema. "Lake Winnipeg doesn't have to be viewed as an expensive environmental management problem. There are ways to bring sustainable development principals to turn an environmental problem into an innovative and economic opportunity."